DDoS attack is one of the favorite tools used by hackers to disrupt an online service. Here, we are going to tell you more about the attack using an easy-to-understand infographic. Most of us are aware of the fact that DDoS attack- Distributed Denial of Service- is one of the most common attacks faced- and the recent times have seen a tremendous growth in such attacks. Recently, the New York Magazine’s website was down due to an alleged DDoS attack for more than 12 hours. For those who are new to this term, in simple works, a DDoS attack is an attempt to make an online service/website unavailable by flooding it with tons of traffic from different sources.DDoS attack is one of the favorite tools used by hacktivists and other online groups to fulfill their motives by hiding behind a storm of HTTP request. The attacker makes a network of infected systems (botnets) by spreading malicious emails and software. After being infected, these systems could be controlled remotely and thus used to deploy a DDoS attack. The infographic shared below is created by Ireland-based security firm Barricade and it gives a visual picture of a DDoS attack and other factors related to it. The good guys at Barricade have used various industry data to show that DDoS attacks affect more than 45% of organizations. With an exponential growth in the internet usage, cyber vandalism and hacktivism have become more prominent and organizations face such DDoS attacks regularly. The security firm notes that launching a DDoS attack costs just $150, while its impacts could be quite expensive. The infographic shows that China and India, followed by the U.S, are the biggest nurseries of DDoS attacks. Share the article if you found the information about DDoS attack helpful. What is DNS (Domain Name System) and How it Works ? Most of us are quite familiar with the term DNS or Domain Name System. DNS can be thought of as an attendance register for various websites present over the internet. In the case of DNS, it maintains the database of all the websites Domain Names and their IP (Internet Protocol) addresses that are operational all over the world. To understand the basic working of DNS, let me guide you with an example of a hotel. Let us assume, you need to visit your friend at some hotel. Now, what will you do? You’ll reach the hotel reception and ask the receptionist for room number of your friend. In order to do so, you’ll need to tell the name of your friend to the receptionist, who’ll check the same in her database and satisfy you with the room number of your friend. She’ll also call your friend to confirm whether he is available or not. Now, try to relate the example to working of DNS. In this case, you’re the client sending a request to a DNS server, the receptionist, and your friend’s name is the domain name and his room number is his IP address. Take the domain name, http://www.google.com. The naming convention moves from right to left and vice-versa for IP address. In the domain name for Google, first the DNS will check for com which stands for commercial domain, and is a top-level domain. Proceeding further, google.com, is a sub-domain to com and subsequently www, is a sub-domain to com domain. The dot (.) is used to separate the domains from their sub-domains. The full domain name can only consist of 253 characters. Now, if some wants to know the domain name registered against an IP address, he will request the DNS server with the IP address of the website. Say, the IP address sent is 31.13.79.246, the DNS will first check the 31 then 13 then 79 and finally 246, concluding that the IP address belongs to http://www.fb.com. The DNS resembles the hierarchy structure of a tree, not the biological one, there is a different tree in computer data structures, in which the address 31 belongs to the top position of the tree and is the primary domain in the hierarchy, addresses 13, 79, 246 are consecutive sub-domains. The number 246 refers to the server machine hosting the website http://www.fb.com. All this domain and sub-domain thing is not that much complicated as you think, but it’ll take some time for you to get it correctly if you’re new to this concept. In earlier days, a master file was maintained by one main server which was updated manually with the entry of every new website and then it was copied by other servers. But, as the count of websites proliferated with time, it was hard to maintain the domain name database manually. So, the need of an automated system was felt and then the ability to automatically update the database all around the world was introduced in the newer generations of DNS. So, if you register your website name with a Domain Name Registrar, it will take around 24 hours for your website to be present in the DNS databases all around the world. The Master-Slave server relations were introduced in which a master server maintained the database and Slave server only had to copy the database to remain updated. In order to facilitate the dynamic updates to DNS database, the mechanisms NOTIFY and IXFR were introduced. In NOTIFY, when the master server updates the database, it sends a notification to the slave servers about the update, which then copies the database. IXFR (Incremental Zone Transfer) eliminates the need to copy the whole database every time a single entry has been made, it allows the slave servers to only add the updated entry in their database, thus reducing the efforts and making the dynamic update process faster. Recursive: Now continuing with the hotel example, assume the hotel has more than one branch in the city, and the receptionist was unable to find your friend’s room number. Then she’ll check if your friend has been staying in the other branch by contacting the receptionist present there. So, if the DNS server in unable to find any IP associated to the domain name sent in the query then it’ll ask the other servers connected to resolve the IP address for the requested domain. It’ll gather the information from those servers and reply to you with the appropriate IP address. Iterative: Suppose you also want to know the floor on which the friend’s room is situated, in order to do so, you’ll again ask the receptionist. Similarly, if the DNS resolver wants more information about a domain, it’ll initiate a new query for the same DNS server. The first and foremost application of DNS is nslookup, in which a DNS server replies with the IP address of the domain name requested in the query. DNS is used by different Mail Transfer Agents (MTA) like Microsoft Exchange Server and IBM Domino, so that they can deliver the e-mails more efficiently. DNS proves to be very helpful in identifying black-listed IP addresses over the internet and barring the users from accessing them. This helps in protecting the users from spam e-mails and potential hacking attacks. The data for each domain name and its IP address is kept on more than one DNS server, so as to retrieve the data in case any problem occurs on one server. Cache Poisoning: Also called DNS Spoofing, is the technique used by malevolent people, in which they alter the data in resolver cache of the DNS server, rendering incorrect IP address to DNS resolver, may be to divert the user to a hacker’s machine. DNS responses are not encrypted thus allowing the possibilities of potential attacks. However, Domain Name System Security Extensions (DNSSEC) are used to render cryptographically signed DNS responses. Phishing attacks can be planned due to visual resemblance of some characters on the user’s screen, like the letter l and 1 appear the same on some screens, thus redirecting users to different IP addresses by displaying the same look and feel as of the original website. What if the that hotel receptionist is very slow and many people are asking for room numbers at same time, then she’ll not be able to provide you with correct room number quickly. So, you may ask some other person at the reception counter to attend your concern. Similarly, when we connect to the internet, we generally use the DNS Server provided by our ISPs. But what if the default DNS server is irresponsive or if it can’t handle a large number of queries at a given moment, such instances will only degrade your browsing experience. But don’t worry, there is another way out. You can configure your system to use a different DNS server for resolving IP addresses. How to configure DNS server? DNS has been a topic of utmost importance since its advent as a systematic way to maintain such a huge database of millions of websites and servers around the world. Without DNS, it would’ve instigated a whole lot of mess of all the domain names and IP addresses, and it would’ve taken ages just to locate google.com from a haphazard collection of all the domain names. DNS has streamlined the process of IP resolution and seriously, if DNS wasn’t there, I know you would’ve burnt your brain circuits in order to remember all those IP addresses. And let me ask you, do you remember Facebook’s IP address I mentioned above. And don’t scroll up now, even I don’t remember it, because DNS is there to remember it for us. We only need to express our gratitude for the noble work DNS has been doing since the last three decades, and it has become faster, smarter and more reliable. Read further: How DDoS Attack Works? Write your thoughts about DNS in the comments section below, and do try to configure the DNS server using the link in the article. How to Get Faster Internet Speed Using DNS Hack. There are many ways to get a faster internet speed in Microsoft Windows. 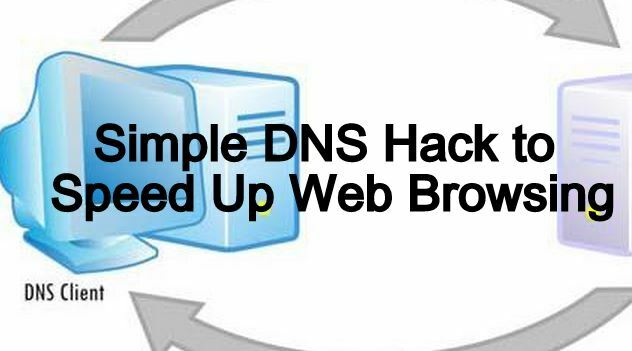 Today, I am going to show you a simple DNS hack that can speed up your Web Browsing dramatically. First, I need to remind you an obvious thing that happens with most of us when we are using a slow internet connection. The only thing we blame is our Internet Service Provider (ISP) for slow internet connection, but this isn’t the only case all the time. Sometimes, the problem lie with our DNS (Domain Name System). So, first let me explain you something about DNS before telling you the method to get a faster internet speed. The domain names are usually alphabetic for us to remember easily, but in actuality the Internet works on IP addresses. The DNS converts the domain name into its corresponding IP address, each time it is used as such. The DNS has a network of its own i.e. one DNS server can ask other DNS servers about translating a specific domain name to its corresponding IP address till it gets the correct result. As I mentioned earlier, your tortoise internet speed isn’t always your Internet Service Provider’s fault, instead it may be your DNS’s fault. So why not use an alternative DNS service? As the present web pages continue to become more and more complex by inculcating innumerable things, so clients go for multiple DNS lookups for rendering one single web page. With the continuous growth in web, the existing DNS infrastructure is under more load each day. There are more benefits of OpenDNS and Google DNS other than getting a faster internet speed. Usually if the DNS server of your service provider goes down you become unable to use the internet, but with OpenDNS and Google DNS method, even if the service providers DNS server is down, you can surf the internet normally. What Actually Is The Internet of Things (IoT) – The Beginner’s Guide. IoT or Internet of Things is a modern-day buzzword that points to the technological advancement that we have had in recent years. Connectivity in all spheres of life through regular devices is what IoTs are trying to achieve. But do you know what IoT or Internet of Things is? Coined by British entrepreneur Kevin Ashton in 1999, IoT or Internet of Things is one of the most interesting subjects which usually overwhelms the discussions on the advancement in the science and technology.IoT is rapidly becoming a big part of human lives, but many are still ignorant of what Internet of Things or IoT actually is! What Actually Is The Internet of Things (IOT)? Now, as confusing as the name Internet of Things already is, we will keep it simple and avoid any jargons. In the network of these connected objects, each device has a unique identity which work in harmony and it is reported that the IoT will expand to 50 billion devices by 2020 inching in all spheres of our life. What is the current state of the Internet of Things? Unlike the other game changer technologies such as Quantum computing, the Internet of Things is already affecting human lives. It has multitudes of uses which are being exploited by both security experts as well as the black hats. IoT offers advanced connectivity and is heralding the revolution in the machine to machine communication. The “things” in the Internet of Things account for the devices ranging from connected automobiles and surveillance cameras to the heart monitoring implants. Many tech giants and startups have entered the race of delivering the best and most secure connected devices to the consumers. The technology which was in the nascent stage a few years back has drastically picked up the pace and here we are listening to reports such as car hack and CCTV botnet attacks. These expose the loose security issues, but at least the direction is right. In near future, majority of our electronic or quantum ( hopefully) devices will be connected to the Internet via unique IP address (IPv6, since IPv4 will soon be filled up) and thus could be controlled by the owner from any place at any time. Developing countries such as India envisaging the flagship projects of Smart Cities will pin their hopes to smart infrastructure combined with the huge influx of IoT technology. As for individuals, wearable connected devices and smart homes would be a key to a smart and sustainable future. The IoTs will also help the governments and big enterprises in monitoring, collecting, analyzing and then providing solutions for any situation in a short time. However, while constant upgradation of the technology will mean more electronic waste, the environment issue and green development should be kept in mind as well. Overall, the Internet Of Things has the capacity to build a futuristic society. Hope you found this useful. Have anything to add on the subject? Tell us in comments below. Get started with IOT development using Ardunio kit and Raspberry pi kit. How much does the internet weigh? No more spoiler here. Read more and find out.